For the railway station, see Enfield Town railway station. The fountain outside Enfield library. The gold post box for Charlotte Dujardin. Enfield was a set settlements united by one church, including by the High Middle Ages in 1303 a small agrarian market town, otherwise hamlets spread around the royal hunting grounds of Enfield Chase. At the time of the Domesday Book the area was spelt 'Enefelde', and had a priest who almost certainly resided in St. Andrew's Church. By 1572 most of the long-distance streets had been completed. The village green, in 1303, became a marketplace making the place a market town; the area between the church and the present fountain. Traders sell products at the regular market, on licence by a non-discriminatory poor relief charity covering the whole Borough. Its name most likely came from Anglo-Saxon Ēanafeld or similar, meaning "open land belonging to a man called Ēana" or "open land for lambs". 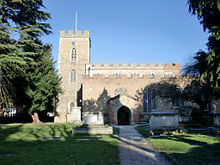 The parish was the largest in Middlesex if excluding from Harrow its Pinner north-west corner, which broke away in 1766; Enfield measured 12,460 acres in 1831, i.e. 19.5 square miles (51 km2). A sixteenth century manor house, known since the eighteenth century as Enfield Palace, is remembered in the name of the Palace Gardens Shopping Centre (and the hothouses on the site were once truly notable; see below). It was used as a private school from around 1670 until the late nineteenth century. The last remains of it were demolished in 1928, to make way for an extension to Pearson's department store, though a panelled room with an elaborate plaster ceiling and a stone fireplace survives, relocated to a house in Gentleman's Row, a street of sixteenth- to eighteenth-century houses near the town centre. In 1303, Edward I granted a charter to Humphrey de Bohun, and his wife to hold a weekly market in Enfield each Monday, and James I granted another in 1617, to a charitable trust, for a Saturday market. The Market was still prosperous in the early eighteenth century, but fell into decline soon afterwards. There were sporadic attempts to revive it: an unsuccessful one of 1778 is recorded, and in 1826 a stone Gothic market cross was erected, to replace the octagonal wooden market house, demolished sixteen years earlier. In 1858, J. Tuff wrote of the market "several attempts have been made to revive it, the last of which, about twenty years ago, also proved a failure, It has again fallen into desuetude and will probably never be revived". The charter of 1303 also gave the right to hold two annual fairs, one on St Andrew's Day and the other in September. The latter was suppressed in 1869 at the request of local tradesmen, clergy and other prominent citizens, having become, according to the local historian Pete Eyre, "a source of immorality and disorder, and a growing nuisance to the inhabitants". The poet John Keats went to progressive Clarke's School in Enfield, where he began a translation of the Aeneid. The school's building later became Enfield Town railway station until it was demolished in 1872. The current building was erected in the 1960s. In 1840 the first section of the Northern and Eastern Railway had been opened from Stratford to Broxbourne. The branch line from Water Lane to Enfield Town station was opened in 1849. Enfield Town had the world's first cash machine or automatic teller machine, invented by John Shepherd-Barron. It was installed at the local branch of Barclays Bank on 27 June 1967 and was opened by the actor and Enfield resident Reg Varney. Enfield Town houses the Civic Centre, the headquarters of the Borough administration,where Council and committee meetings are also held. On Sunday 7 August 2011, after rioting spread from Tottenham, vehicles including a police car were attacked and several shops and business were targeted in the town centre. Most businesses remained closed on Monday 8th and many were not repaired for several weeks after the rioting. The mayor of London, Boris Johnson, later visited the town centre to receive people's views of the riots. 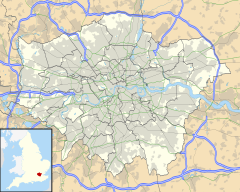 The town is home to two association football teams one being Enfield 1893 F.C. and the other being Enfield Town F.C. formed by the original Enfield Supporters' Trust. The original Enfield F.C. played in the Isthmian League until they were liquidated in 2007. Enfield Town station is well connected with National Rail services to Liverpool Street in Central London operated by London Overground. Services from Enfield Chase station also provide alternative services to Central London and connects the area to Letchworth Garden City. Enfield Town has excellent bus links.London Buses routes 121, 191, 192, 231, 307, 313, 317, 329, 377, 629, W8, W9, W10, night route N29, and non-London route 610 serves Enfield Town. ^ "Enfield Ward population 2011". Neighbourhood Statistics. Office for National Statistics. Archived from the original on 22 October 2016. Retrieved 21 October 2016. ^ A P Baggs, Diane K Bolton, Eileen P Scarff and G C Tyack, 'Enfield: Introduction', in A History of the County of Middlesex: Volume 5 ed. T F T Baker and R B Pugh (London, 1976), pp. 207-208. British History Online http://www.british-history.ac.uk/vch/middx/vol5/pp207-208 [accessed 24 May 2018]. ^ Historic England. "Details from image database (200594)". Images of England. Retrieved 3 June 2011. ^ A P Baggs; Diane K Bolton; Eileen P Scarff; G C Tyack (1976). T F T Baker; R B Pugh, eds. "Enfield: Manors". A History of the County of Middlesex: Volume 5: Hendon, Kingsbury, Great Stanmore, Little Stanmore, Edmonton Enfield, Monken Hadley, South Mimms, Tottenham. Institute of Historical Research. Retrieved 3 June 2011. ^ Tuff, J. (1858). Historical, Topographical and Statistical Notices of Enfield. Enfield: J.H. Meyers. " ^ "Historical Information". Old Enfield Charitable Trust. Retrieved 19 September 2011. ^ "The man who invented the cash machine". BBC News. 25 June 2007. Retrieved 2 May 2010. ^ "Enfield". Palace Exchange. Retrieved 2011-06-30. Pam, David (1992). A Victorian Suburb. A History of Enfield. Enfield: Enfield Preservation Society. Ford, Edward; George H. Hodson (1873). A History of Enfield in the County of Middlesex. Enfield. Retrieved 19 September 2011.